The North Virginia Park Woodland is a relatively small remnant portion of a mixed-wood forest stand consisting primarily of older growth white spruce intermixed with balsam poplar and white birch. The site has a well-developed, shrubby understory that includes such species as wild raspberry, red-osier dogwood, mountain ash, snowberry, low-bush cranberry, ferns, and many others. This stand is located in close proximity to the Blackmud Creek ravine area and although its size is somewhat limited, it provides excellent stepping-stone habitat for many species, particularly songbirds and small mammals. 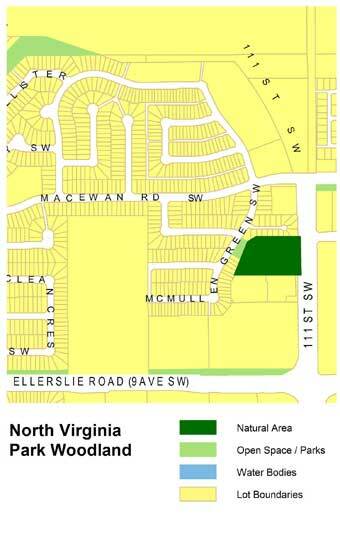 The North Virginia Park Woodland is located at 3921 McMullen Green S.W. and extends between McMullen Green and 111 Street. Parking can be found along side streets close to the natural area; however, a formal parking area is not available and the treestand cannot be accessed from 111 Street. There are some unimproved trails through the centre of the stand and much of the area can be viewed from the park entrance along McMullen Green and surrounding areas. This primarily coniferous treestand provides habitat to many songbirds and small mammals and is a stepping-stone habitat to the nearby Blackmud Creek ravine. 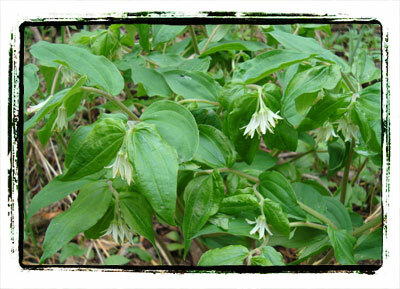 There is a diverse assemblage of vegetation species in this natural area, particularly in the well-developed understory.